Salivary gland tumours usually present as a lump or swelling in the affected gland which may or may not have been present for a long time. The lump may be accompanied by symptoms of duct blockage (e.g. xerostomia). 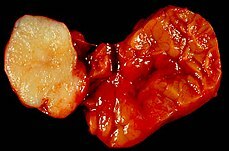 Usually, in their early stages it is not possible to distinguish a benign tumour from a malignant one. One of the key differentiating symptoms of a malignant growth is nerve involvement; for example, signs of facial nerve damage (e.g facial palsy) are associated with malignant parotid tumours. Facial pain and paraesthesia are also very often associated with malignant tumours. Other red flag symptoms which may suggest malignancy and warrant further investigation are fixation of the lump to the overlying skin, ulceration and induration of the mucosa. Coronal MRI showing right parotid adenoid cystic carcinoma. Physical exam and history: An exam of the body to check general signs of health. The head, neck, mouth, and throat will be checked for signs of disease, such as lumps or anything else that seems unusual. A history of the patient's health habits and past illnesses and treatments will also be taken. Endoscopy: A procedure to look at organs and tissues inside the body to check for abnormal areas. For salivary gland cancer, an endoscope is inserted into the mouth to look at the mouth, throat, and larynx. An endoscope is a thin, tube-like instrument with a light and a lens for viewing. Fine needle aspiration (FNA) biopsy: The removal of tissue or fluid using a thin needle. An FNA is the most common type of biopsy used for salivary gland cancer, and has been shown to produce accurate results when differentiating between benign and malignant tumours. Radiographs: An OPG (orthopantomogram) can be taken to rule out mandibular involvement. A chest radiograph may also be taken to rule out any secondary tumours. Ultrasound: Ultrasound can be used to initially assess a tumour that is located superficially in either the submandibular or parotid gland. It can distinguish an intrinsic from an extrinsic neoplasm. Ultrasonic images of malignant tumours include ill defined margins. Benign tumour of the submandibular gland, also known as pleomorphic adenoma, presented as a painless neck mass in a 40-year-old man. At the left of the image is the white tumor with its characteristic cartilaginous cut surface. To the right is the normally lobated submandibular salivary gland. Most patients with early-stage lesions that are resectable generally tend to undergo surgery as their initial therapeutic approach, whereas those with advanced or unresectable cancers tend to be treated with radiotherapy (RT) alone or chemoradiotherapy (CRT), which hampered the comparison of the efficacy of RT alone with that of surgery combined with adjuvant RT. But some effort had been made to reflect the role of surgery in salivary gland tumours. Fast neutron therapy has been used successfully to treat salivary gland tumors, and has shown to be significantly more effective than photons in studies treating unresectable salivary gland tumors. Chemotherapy Currently little is known about the efficacy of chemotherapy in treating salivary gland tumours. Chemotherapy, which plays an important role in systemic therapy, is generally reserved for the palliative treatment of symptomatic locally recurrent and/or metastatic disease that is not amenable to further surgery or radiation. Conventional chemotherapy regimens, such as cisplatin and 5-FU or CAP (cisplatin, doxorubicin, and cyclophosphamide) are still utilized as first-line therapy for patients with advanced lesions. Targeted Therapy - Due to the poor results with chemotherapy, it's urgent to explore novel therapeutic interventions for this disease. And great expectations have been put into individualized therapies: in particular, the EGF receptors family (EGFR and HER2), KIT and androgen receptors are the most commonly investigated molecular targets in SGCs. Their expression seems not to be linked to its pathogenetic role in the development of SGCs, but more to the histogenetic origin of the tumor cells. Various targeted agents, such as imatinib, cetuximab, gefitinib, trastuzumab, had been used for exploring new treatment for salivary gland tumours, but on account of the rare incidence of salivary gland tumours, the number of cases available on targeted therapy for analysis is relatively small. Little is known about the total incidence of salivary gland tumours as most benign tumours go unrecorded in national cancer registries. The majority of salivary tumours are benign (65-70%). Within the parotid gland 75 - 80% of tumours are benign. Around 50% of the tumours found in the submandibular glands are benign. Sublingual gland tumours are very rare but if present, they are most likely to be malignant. In the United States, salivary gland cancers are uncommon with an incidence rate of 1.7 in 100000 between 2009 and 2013. ^ Shah JP; Patel SG (2001). Cancer of the Head and Neck. PMPH-USA. p. 240. ISBN 978-1-55009-084-0. ^ a b Odell, Edward W. (2017). Cawson's essentials of oral pathology and oral medicine (Ninth ed.). [Edinburgh]: Elsevier Health Sciences. ISBN 0702049824. OCLC 960030340. ^ a b c Mehanna, Hisham; McQueen, Andrew; Robinson, Max; Paleri, Vinidh (2012-10-23). "Salivary gland swellings". BMJ. 345: e6794. doi:10.1136/bmj.e6794. ISSN 1756-1833. PMID 23092898. 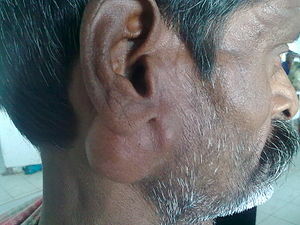 ^ "Salivary Gland Cancer". MedicineNet. ^ Mounika, C. "Salivary Gland Tumors". SlideShare. ^ Lee YY, Wong KT, King AD, Ahuja AT (June 2008). "Imaging of salivary gland tumours". Eur J Radiol. 66 (3): 419–36. doi:10.1016/j.ejrad.2008.01.027. PMID 18337041. ^ a b Barnes L (23 December 2008). Surgical Pathology of the Head and Neck. 1 (3rd ed.). Taylor & Francis. p. 511. ISBN 978-0-8493-9023-4. ^ Barnes L (2005). "Chapter 5: Tumors of the salivary glands (chapter authors: Eveson JW, Auclair P, Gnepp DR, El-Naggar AK)". Pathology and Genetics of Head and Neck Tumours (PDF). International Agency for Research on Cancer, World Health Organization. p. 210. ISBN 978-92-832-2417-4. ^ Douglas JG, Koh WJ, Austin-Seymour M, Laramore GE (September 2003). "Treatment of salivary gland neoplasms with fast neutron radiotherapy". Arch. Otolaryngol. Head Neck Surg. 129 (9): 944–8. doi:10.1001/archotol.129.9.944. PMID 12975266. ^ Laramore GE, Krall JM, Griffin TW, Duncan W, Richter MP, Saroja KR, Maor MH, Davis LW (September 1993). "Neutron versus photon irradiation for unresectable salivary gland tumors: final report of an RTOG-MRC randomized clinical trial. Radiation Therapy Oncology Group. Medical Research Council". Int. J. Radiat. Oncol. Biol. Phys. 27 (2): 235–40. PMID 8407397. ^ Krüll A, Schwarz R, Engenhart R, Huber P, Lessel A, Koppe H, Favre A, Breteau N, Auberger T (1996). "European results in neutron therapy of malignant salivary gland tumors". Bull Cancer Radiother. 83 Suppl: 125–9s. PMID 8949764. ^ Creagan, ET; Woods, JE; Schutt, AJ; O'Fallon, JR (1 December 1983). "Cyclophosphamide, adriamycin, and cis-diamminedichloroplatinum (II) in the treatment of advanced nonsquamous cell head and neck cancer". Cancer. 52 (11): 2007–10. PMID 6684986. ^ Mino M, Pilch BZ, Faquin WC (December 2003). "Expression of KIT (CD117) in neoplasms of the head and neck: an ancillary marker for adenoid cystic carcinoma". Mod. Pathol. 16 (12): 1224–31. doi:10.1097/01.MP.0000096046.42833.C7. PMID 14681323. ^ "About salivary gland cancer | Salivary gland cancer | Cancer Research UK". www.cancerresearchuk.org. Retrieved 2017-11-17. ^ American Cancer Society (2017). Cancer Facts and Figures 2017, Special Section: Rare Cancer in Adults. Atlanta: American Cancer Society. Clinically reviewed salivary gland cancer for patients from Cancer Research UK. This page was last edited on 24 February 2019, at 21:46 (UTC).